UPAVIM Crafts is a cooperative of approximately 80 women who live in marginalized communities on the outskirts of Guatemala City. The women in the organization are all mothers and homemakers, some widows, and some abandoned. Many are the sole providers of economic support for their families. 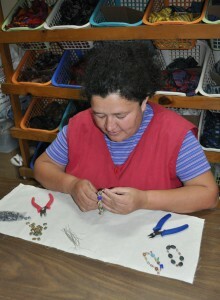 The woman in the photo is Sonia, who is in charge of items made by hand. She at times teaches the other women to make jewelry and other items, she packages all the materials to the others to take home and construct and she sometimes comes up with designs.